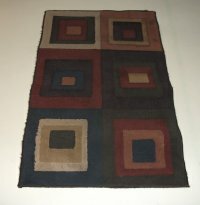 Olefin Area Rug Cleaning - Salvaging The Indestructible Rug! Olefin area rug cleaning can restore beauty and functionality to rugs that have taken a beating. The advantage of olefin rugs is they are fairly indestructible! Olefin as a fiber is solution-dyed, which translates into terrific resistance to permanent staining. Olefin rugs will never be heirlooms, but they are valuable additions to our homes nonetheless. From a functional standpoint, they provide comfort to hard floors and collect soil from walk-off traffic. From a style standpoint, sometimes they are the perfect accent to a room, or maybe even the rooms decorative focal point. In the photo to the right I've flipped the rug over for dusting. I have my Westy Brandy helping me in the rug studio, but right now she's laying down on the job! She gave me a "picked on" look when I gently suggested she move. To the left is a colorful olefin rug with a "Southwestern" motif. 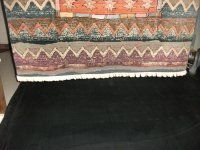 The fringe on this rug needed detailing after cleaning. In the end though, it cleaned up beautifully! The rug below has been cleaned and I have laid it out for post-vacuuming and prep for delivery. 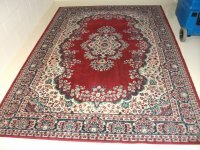 It has rich, vibrant colors and is styled in a traditional oriental rug pattern. This style of olefin rug always cleans up beautifully! 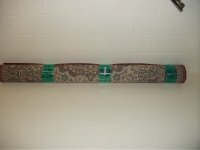 The rug has been rolled up, wrapped, tagged, and is ready for delivery. From pickup to delivery we need between 7 and 14 days depending on rug and fiber type and soiling conditions. We can usually give you a good idea ahead of time as to a projected delivery date.